Have you seriously considered the reality of who God is, what God’s purpose is for humanity, and what God has done for all of us? If you reflect really hard about this, there is really no other response to life that does God justice. The love that God the Father has for us is manifested in letting us be called his children, John says in 1 John 3:1. We all are beloved by God and are being constantly invited by him to love him in all things. All of us can respond, no matter what one's perceived or real limitations are. Your being, living and working are a participation in God's love. How can you respond to such a generous Giver? Today, on the Feast of St. Ignatius of Loyola, we wish to share the 'Suscipe' or 'Take, Lord, and receive', a radical prayer by St. Ignatius about total self-giving. It’s not a formula for easy decision making that we can adopt one day after a lifetime of making decisions based on other, more ordinary or even self-centered thinking. Rather, it is the product of self awareness and of openness to God’s abiding love. We hope you can express your own love-response to God using this prayer. May the God who dwells in you and in all of us help you respond with a generous heart. Many thanks to gc35videos for the video. Our psalm settings in English are by Tinnah M. dela Rosa and Kent Lardizabal while the 2-page psalm in Filipino is by Migs Miguel. Please click the pictures or the highlighted link to download the high resolution PDF files of our composers. Go to the readings for next Sunday (August 3, 2014) in English via the US Conference for Catholic Bishops or in Filipino via the Word and Life Publications. Have you ever been a Doubting Thomas once in your life? This famous idiom came from Thomas the Apostle, as mentioned in the Holy Bible. The Gospel of St. John tells how Thomas was skeptical at first when he heard that Jesus had appeared to the other apostles, "Unless I see the nail marks in his hands and put my finger where the nails were, and put my hand into his side, I will not believe." (NIV, v.25) But when Jesus appeared later and let Thomas see and touch his wounds, Thomas proclaimed "My Lord and my God!" (NIV, v.28). Doubting Thomases are skeptics. Like Thomas, did we, at first, doubt God’s plan for our lives? Did we not place our trust in Him fully? The more we lose trust, the more we stumble and fall. Our faith should be likened to a deeply rooted tree — one which can withstand any storm. How do we achieve this? Three things: surrender, trust, prayer. May this simple song by Jaci Velasquez, entitled “Lay it down,” help you in praying to lay down everything unto God in sweet surrender. And may we not doubt again God’s wonderful plan for mankind. Many thanks to Nathaniel Silva for the video and to Em Alcantara for the reflection! The Gaudium Mass CD is one of the Best Inspirational Album Finalists in the 35th Catholic Mass Media Awards (2013). You may view the Gaudium Mass playlist here. 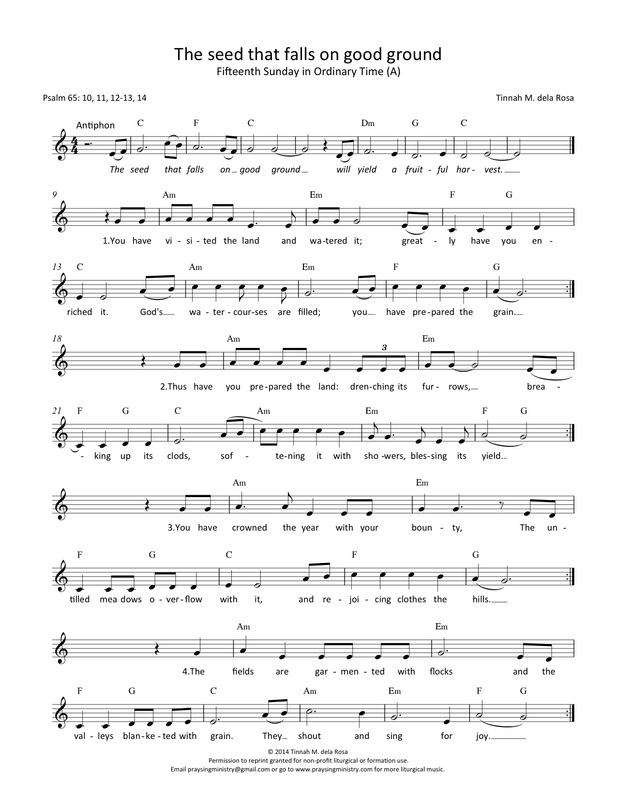 This song is one of the 29 tracks in the Gaudium Mass CD and 43 pieces in the songbook. 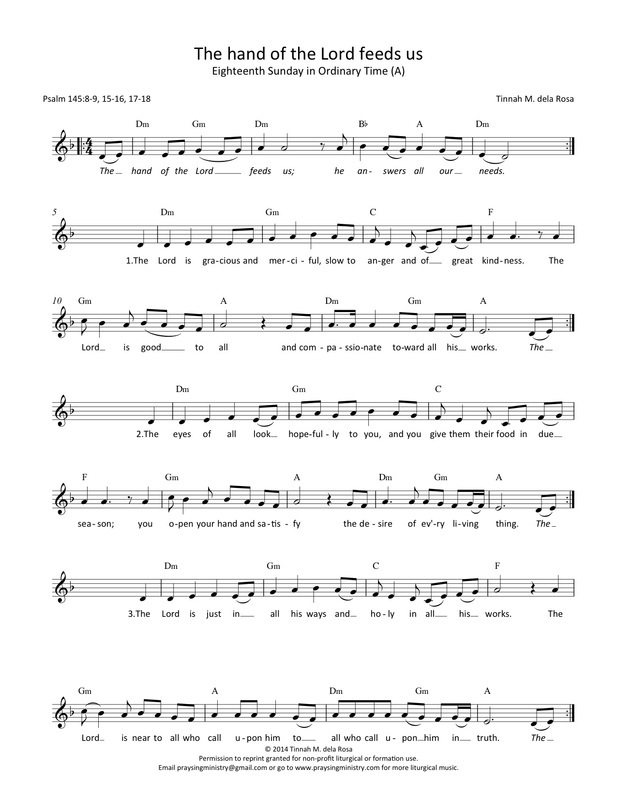 Want more music for the New Roman Missal? Please visit this link. Please click the pictures or the highlighted link to download the high resolution PDF files of our composers. Click the highlighted link to view the readings in English for next Sunday (July 27, 2014) via the US Conference for Catholic Bishops website. When you encounter hardships and hurts of all kinds, what do you do? When things go awry and plans turn upside down, where do you run? We all have our share of a broken heart, or dream and even being stuck in a mess in life. When everything seems to fall apart, do you run to the Lord Who brings light, calms the storm and steadies our heart? If you have been running away when these things happen, we invite you at this very moment to run instead in prayer towards Christ, Who is always here and real with you. As your pray with the song, “Steady My Heart” performed by Kari Jobe, ask for the grace of trust and tranquility, believing that no matter what you may be going through in life, you have a God who loves your soul, heals your scars and steadies your heart. Remembering painful and difficult experiences in God’s presence will usher in renewed hope, true acceptance and a stronger faith. This inspiring song also echoes the message of Jesus in today’s gospel, wherein He tells us, “Come to me, all you who labor and are burdened, and I will give you rest.” May your prayer and reflection today bring you peace and the assurance that you are well-taken care of -- for you are exactly where you should be, right inside the loving hands of God. May you have a worry-free and steady Thursday! Many thanks to smilealways06 for the video and Delson Balance for the reflection! Our Tuesday PraySing material is the song "Glorify God by your life" from the Gaudium Mass by Tinnah dela Rosa. This song was recorded live during the Gaudium Mass launch in November 2012. 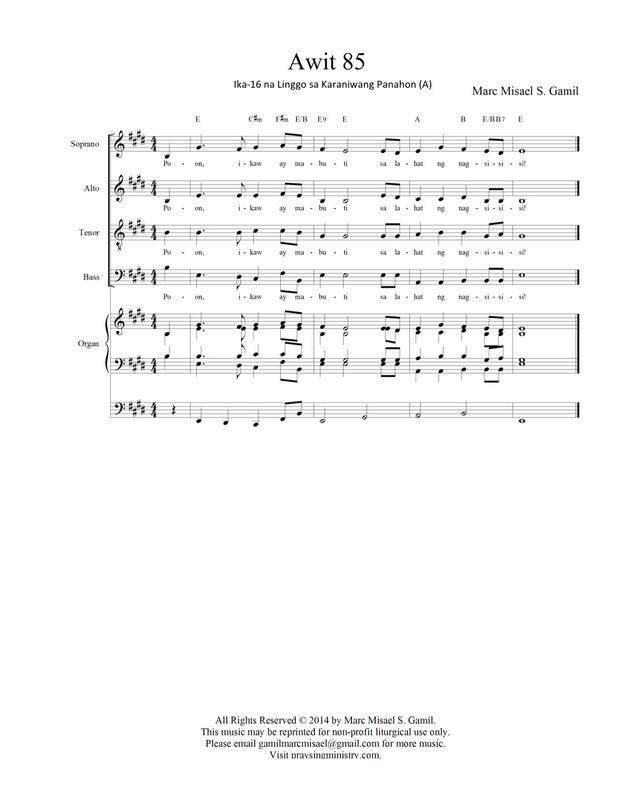 It is performed by Kilyawan Consortium of Voices and PraySing Ministry Chorale. 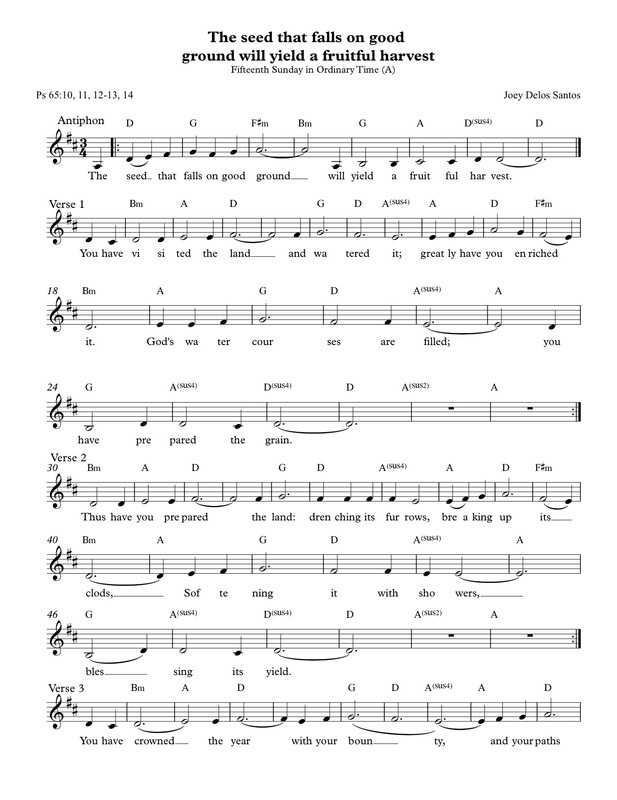 This closing song captures the missioning at the end of the mass by joining the congregation in recalling all that has been offered and given to them during the mass, and committing to go forth and share these gifts with the world in order to truly glorify God! Please click the pictures or the highlighted link to download the high resolution PDF files of our composers. Click the highlighted link to view the readings in English for next Sunday (July 20, 2014) via the US Conference for Catholic Bishops website or the readings in Filipino via the Word and Life Publications. In whom do you take refuge when life's struggles creeps in? As you reflect with the song, "Every Promise of Your Word" by Keith and Kristyn Getty, let the song resonate with you as it echoes the song 'The Faithful One'. Recall how God's presence had been constant from the very beginning. Let this positive vibe dwell within you and let it be. Life may be tough and difficult and yet He remains the stronghold Whom you could rely and get your strength from forever and always. He comes as a Good Shepherd ready to seek everyone who is lost, in despair, in sorrow and in pain. He comes to you where you are. May our prayer not simply to be delivered from your pain but to help you be strong. May you choose to let it mold you to becoming better persons for God and for others, that you may live fully human lives in justice and in love. Many thanks to giveitupfortheviolas for the video and Friel Canto for the reflection. 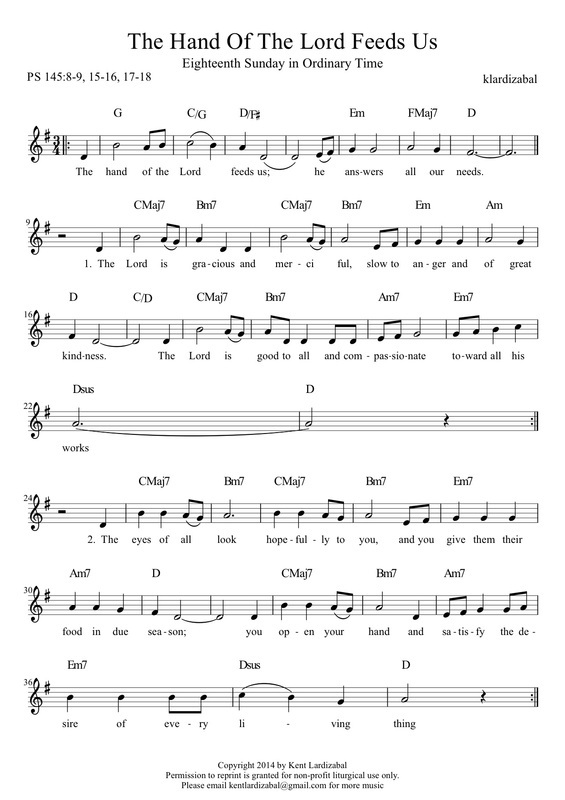 Our 2-page psalm setting in Filipino is by Dennis N. Marasigan and our two psalm settings in English are by Tinnah M. dela Rosa and Joey Delos Santos. Please click the pictures or the highlighted link to download the high resolution PDF files of our composers. Click the highlighted link to view the readings in English for next Sunday (July 13, 2014) via the US Conference for Catholic Bishops website or the readings in Filipino via the Word and Life Publications. What words of comfort can you tell someone who is on the verge of a breakdown? When one's life is on the line, when everything seems like a desperate uphill climb, it is hard to find words of comfort to say. All one can do sometimes is to simply walk with them, to listen, and to truly be present through their rough times. 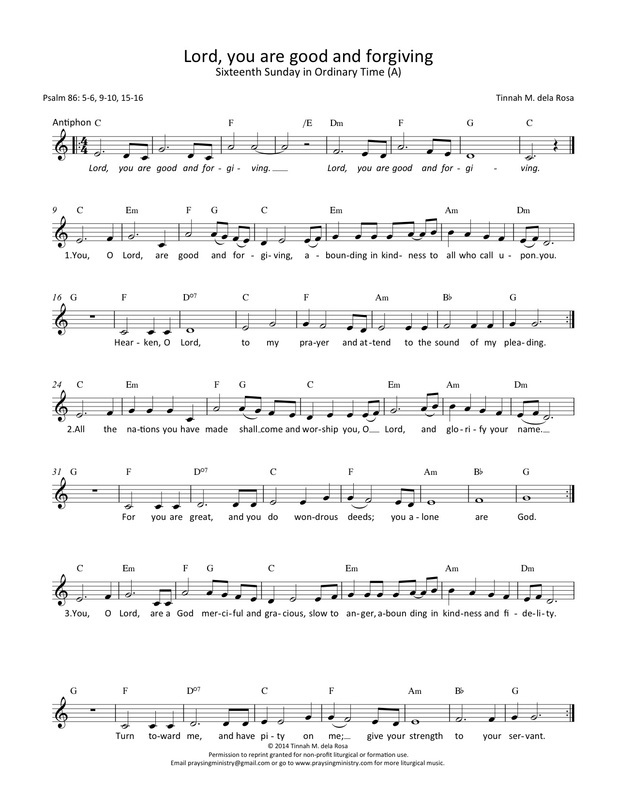 As you pray with this song, "There is nothing greater than grace" performed by Point of Grace, try to recall your experience of 'valleys' or of 'darkness'. How did you survive that experience? Who was it who walked with you, listened to you, or was truly present to you at that time? Can you sense God's hand in the experience? Talk to Jesus in thanksgiving for the grace he gives. Whether one feels lost, feels unloved, or is at the end of their line, there is indeed nothing that outdoes the grace of God in Christ Jesus. May you recognize the grace that is greater than all your problems combined today and everyday! Many thanks to Bob Marshall for the video! Today we wish to share a sample video of 'As We Gather', an entrance song from the Gaudium Mass by Tinnah M. dela Rosa.